You are here: Home / Kiwi Coast News / Finding Barney!! 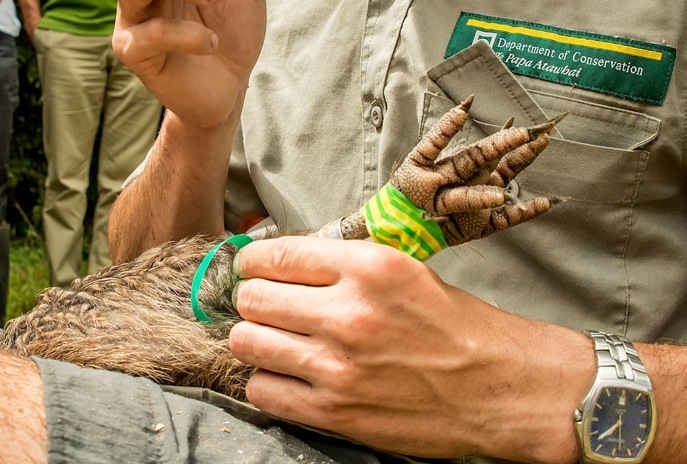 Barney the kiwi leads trackers on a merry adventure and Brent Lewis from the Tutukaka Landcare Coalition discovers that finding a kiwi with a transmitter is not as easy as it sounds! 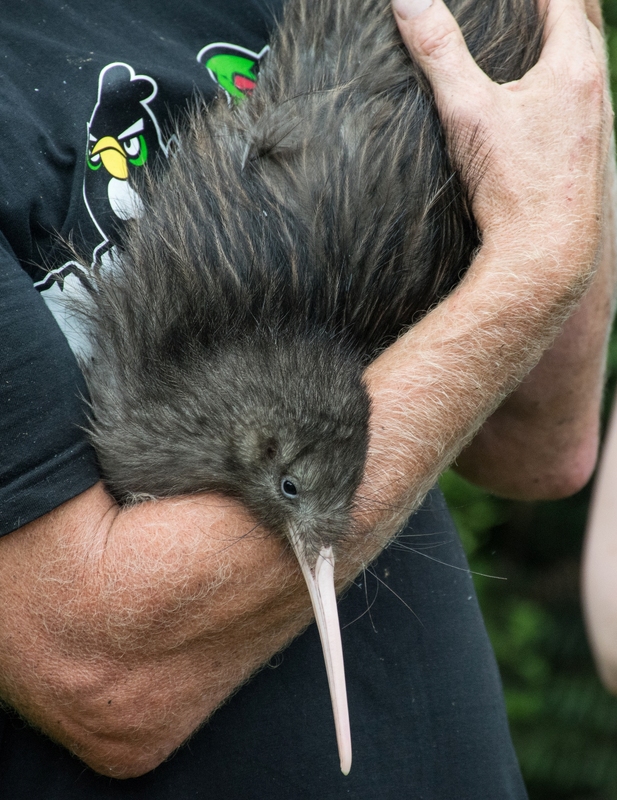 Here’s a wonderful first-hand account from Brent about the kiwi finding adventure he had when accompanying three Accredited Kiwi Handlers and their specially trained dog a couple of weeks ago during the WWF-New Zealand and Reconnecting Northland visit to the Kiwi Coast. We walked quietly down the slippery clay track, three kiwi experts, their specially trained dog, and me to find Barney the kiwi who was due for a check-up. It had rained the night before and our Kauri Die-Back cleaned boots had a bit of trouble finding secure footing as we waked a short distance to the general area where Barney called home. Generally he could either be found down by the wetland area, or on the side of a ridge covered in the usual manuka and totara amongst which was sprinkled the invasive weed pampas and the native tātaramoa or bush lawyer, always dangling to catch skin and clothes in its thorny embrace. The kiwi trackers, who were from the Department of Conservation and Northland Regional Council, had two radio receivers, smallish devices with hand held antennas that looked like old fashioned TV aerials, and with these we quickly triangulated Barney’s sleeping spot to be on the ridge. With a bit of to-and-fro along the track we narrowed down his location and climbed up through the dense manuka to where his transmitter was silently giving away his hidey-hole. Barney seemed to be snoozing in a clump of three Pampas bushes. It was time to release the hounds as Mr Burns would say. The old dog quietly mooched around, checking out tunnels that Barney had made, but still we couldn’t find him. The boys took the aerials off the receivers and waved them around, hoping to pin Barney down, but still no luck. The pings coming from the electronics was just not precise enough. There was only one way for it, and that was to crawl through the rain wet cutty grass of the pampas, searching by torch and practiced eyes. Slowly and carefully we methodically searched every centimetre of the tangled dry grass at the base of the pampas. Then suddenly there was a rustle, and Barney’s powerful legs launched him out of his home as he tried to escape the smelly people seeking him out. But it was to no avail, as with a practiced catch he was grabbed safely by his legs, securing his dinosaur-like claws. Despite the careful handling Barney still expressed his annoyance at being caught with grunting vocalisations. A short time later Barney was sitting quietly in a purpose built box, nice and dark with a bed of fresh ferns. And so ends the tale of finding Barney. We nearly didn’t find him, and only after four people, two gadgets, a specially trained dog, lots of experience and an hour of meticulous searching did we manage to check his health and adjust his transmitter. Sadly stoats have no such problem. Barney is a wonderful bird, with soft feathers and dare I say gentle eyes. Barney and his ancestors have been here a long time, with the oldest known fossil dating back a million years. With all our work and help let’s ensure our wonderful and unique kiwi can remain here for another million years. If you would like to submit an article contact Ngaire the Kiwi Coast Coordinator.